In the aftermath of the devastating March 11 earthquake and tsunami that struck the northeast coast of Japan, the Japanese public is resilient. 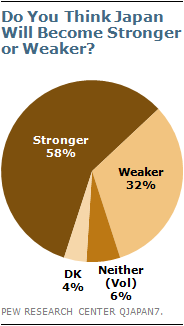 Indeed, a majority believe that as a result of the disaster, Japan will become a stronger, rather than weaker nation. And while personal pessimism about the future has crept up slightly, on balance the public’s overall sense of personal well being appears little changed by the calamitous events of 2011. What is clear, however, is that most Japanese foresee a rocky economic road ahead. A 52% majority expect economic conditions to worsen over the next 12 months. In 2010, as the national economy showed signs of recovering from the global recession, only 33% of the Japanese public thought economic conditions would deteriorate in the coming year. And while hopeful about the long-term future of the country, few Japanese see the current economy as a solid foundation for rebuilding after the March tragedy. Just 10% describe the economy as good, compared with 88% who say the economic situation in the country is bad. These views are virtually identical to last year. These are the principal findings from a survey by the Pew Research Center’s Global Attitudes Project, conducted by telephone with 700 adults in Japan between April 8 and April 27, 2011.1 The poll found that while the immediate brunt of the 9.0 magnitude earthquake and tsunami was concentrated in only a few coastal areas, 41% of Japanese across the country report being affected by the earthquake and tsunami in some way. Roughly a quarter (26%), for instance, say that as a result of the earthquake and tsunami they had trouble obtaining food or clean drinking water, while 18% experienced electrical blackouts. Overall, 13% of Japanese say they lost time at work, while one-in-ten reports physical damage to their homes or property. The Japanese public applauds how the country’s Self Defense Force has responded to the March 11 earthquake and tsunami, but is highly critical of the how the government and the Tokyo Electric Power Company (TEPCO) have handled the multiple disasters. More than nine-in-ten (95%) describe the Self Defense Force’s response positively. By contrast, only about 20% say the national government or Prime Minister Naoto Kan have responded well to the crisis. The harshest criticism is reserved for TEPCO, with just 10% saying the power company has done a good job responding to the earthquake and tsunami. A modest majority (54%) give the media favorable marks. The poll finds that while the Japanese are broadly unhappy with their own government’s handling of the March 11 catastrophe, there is considerable praise for the United States in assisting Japan with the impact of the earthquake and tsunami. A majority say the U.S. has done a great deal to help with relief efforts in Japan. Far fewer say the United Nations, European Union or China have done a great deal to assist Japan with the aftermath of the disaster. Thanks in part to American relief efforts, favorable opinion of the U.S. is at its highest point in nearly a decade, climbing to 85% positive this spring. The image of the United Nations has also improved in conjunction with earthquake assistance, and China’s image has seen a modest uptick. One of the biggest questions raised by the March 11 earthquake and tsunami is nuclear safety. About six-in-ten (59%) in Japan are worried that they or someone in their family may have been exposed to radiation from the damaged Fukushima Daiichi nuclear plant. About seven-in-ten (69%) say they disapprove of how the national government has handled the situation at the crippled nuclear facility. Not surprisingly, few Japanese want their country to increase its use of nuclear power. However, opinion is about evenly split as to whether Japan should maintain (46%) or reduce (44%) its current level of reliance on nuclear energy. The Japanese public is putting on a brave face in the wake of the historic devastation wrought by the March 11 earthquake and tsunami. Fully 58% of the public believes that Japan will become a stronger nation as a result of the twin disasters, while about a third (32%) think the March calamities will weaken the country. This sense of promise is consistent across age, income and other major demographic groups. Yet, there is also a clear sense that the road ahead will be rocky. A majority (52%) expect the economic situation in the country to worsen over the next 12 months, compared with 31% who say it will remain the same and 17% who believe it will improve. This is a much more bearish appraisal than in 2010, when far more (52%) thought the economy would remain the same, and considerably fewer (33%) foresaw a worsening economic situation. Adding to the perceived challenge of rebuilding, nearly nine-in-ten (88%) describe the present economy as bad – identical to the number who felt this way in 2010. Just 10% say the economy is in good shape, virtually unchanged from last year (12%). Similarly, only a quarter say they are satisfied with the country’s current direction, while more than seven-in-ten (72%) say they are dissatisfied. The sense that the country is headed in the wrong direction has been the majority view for nearly a decade. Although communities along Japan’s northeast coast bore the brunt of the devastation on March 11, 41% of Japanese from across the country report being affected by the earthquake and tsunami.2 Trouble finding food or clean water and electrical blackouts are the difficulties most frequently attributed to the twin disasters. Roughly a quarter (26%) of Japanese say they or a household member have had trouble finding food or clean drinking water as a result of the March calamity, while 18% report experiencing power outages. Smaller numbers report losing time at work or suffering property damage. A little more than one-in-ten (13%) claim to have lost time at work due to the earthquake and tsunami, while 10% blame the disaster for damage to their home or property. 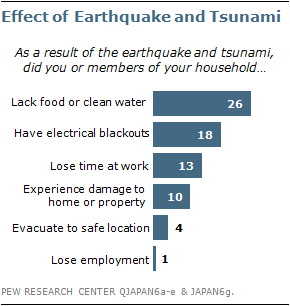 Overall, just 4% report having to leave their home to go to a safe location, while barely anyone (1%) says they or a household member lost a job due to the earthquake and tsunami. When asked to place themselves on a “ladder of life,” where zero represents the worst possible life and 10 the best possible life, 42% of Japanese rate their current lives at least a seven, compared with 45% who describe their life satisfaction as medium and 10% who say they have a low quality of life. These percentages are virtually unchanged from last year. However, there is a slight uptick in the number of Japanese who anticipate having a lower quality of life in five years. Roughly three-in-ten (31%) are pessimistic today, compared with about a quarter (24%) a year ago. Meanwhile, 29% today are optimistic that their life satisfaction will improve in five years, compared with over a third (36%) who believe it will remain the same. In 2010, the percentages were essentially the same: 32% anticipated life improving, while 38% anticipated no change. The Japanese public is generally critical of the national government’s response to the March 11 earthquake and tsunami. A major exception is the country’s Self Defense Force (SDF), which earns widespread praise for its response to the disasters. More than nine-in-ten (95%) say the SDF has done a good job responding to the crisis, including 62% who say the force has done a very good job. A smaller majority (54%) give Japan’s news organizations, such as television, radio, newspapers and magazines, favorable marks for their handling of the disaster. However, only 10% describe the media’s response as very good. By contrast, only a minority of Japanese say the national government has responded well to the earthquake and tsunami. Just one-in-five (20%) give the government positive marks. Roughly eight-in-ten (78%) rate the government’s performance as poor, with a third (33%) of Japanese describing the government’s response as very poor. 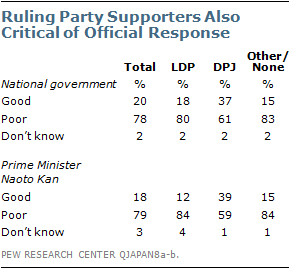 Even among supporters of the ruling DPJ, only 37% describe the government’s handling of the crisis as good. Among supporters of the opposition LDP, roughly one-in-five (18%) rate the government’s performance positively, while just 15% of those who back other political parties, or no party, applaud how the government has responded to the March 11 disaster. The public gives Prime Minister Naoto Kan’s handling of the earthquake and tsunami nearly identical marks to those of the government: 18% say he has done a good job responding to the disaster, compared with 79% who rate his efforts as poor. 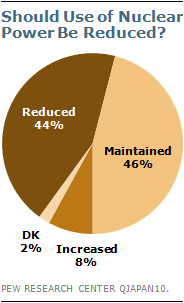 Again, only a minority of DPJ backers (39%) favorably assess Kan’s performance. Among supporters of the LDP, as well as backers of other parties or no party, many fewer (12% and 15%, respectively) say Kan has performed well. Compared with the government, TEPCO is even more widely criticized for its response to the March 11 disaster, likely reflecting public frustrations with the company’s handling of the crisis at its Fukushima Daiichi nuclear plant. Only about one-in-ten (11%) think TEPCO has done a good job handling the disaster, while 86% say the utility has done a poor job. 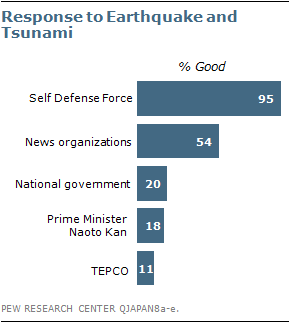 Fully half of Japanese describe TEPCO’s response to the earthquake and tsunami as very poor. Overwhelmingly, the Japanese public believes the United States has provided significant assistance to their country since the earthquake and tsunami. Most (57%) say the U.S. has done a great deal to assist their country, while another 32% say it has done a fair amount. Fewer than one-in-ten think the U.S. has not done very much (7%) or has done nothing at all (1%). Many also say the European Union (66%), United Nations (49%), and China (50%) have helped Japan in this time of crisis, although few say any one of these has provided a great deal of assistance (17%, 15% and 12%, respectively). The perception of U.S. generosity has led to a significant improvement in America’s overall image. In 2010, 66% of the Japanese polled said they had a favorable opinion of the U.S.; today, 85% express a favorable view – the highest percentage recorded since the Pew Global Attitudes Project began tracking this question in 2002. Among those who say the U.S. has provided a great deal of assistance, 93% express a positive opinion. Ratings for the UN also have improved. When the Global Attitudes Project last asked about the UN in 2009, 45% of Japanese viewed the organization positively; now, 61% do so. Although opinions about China remain largely negative, the percentage with a positive view of Japan’s traditional Asian rival has risen from 26% last year to 34% today. About seven-in-ten (71%) Japanese currently say they have a favorable opinion of the EU, essentially unchanged from last year. With efforts to address the earthquake and tsunami damage at the Fukushima Daiichi plant still ongoing, a majority of Japanese (59%) are worried that they or some in their family may have been exposed to radiation from the plant. That includes roughly three-in-ten (31%) who say they are very worried about this possibility. Concerns about radiation exposure are higher among older Japanese, with 72% of those over 60 years of age saying they are concerned, compared with 58% among 40-59 year olds and 46% among 18-39 year olds. Worries about radiation exposure are also more pronounced among women and those with less education. Nearly two-thirds (64%) of women express concerns about radiation from the Fukushima Daiichi plant, while only 54% of men say they are anxious about this possibility. Meanwhile, 64% of those with a high school degree or less education worry about being exposed to radiation from the damaged nuclear facility, compared with roughly half (48%) of college-educated Japanese. Japan’s government has come under considerable criticism for its response to the crisis at the Fukushima nuclear plant. A large majority of Japanese (69%) disapprove of the way their government has handled the situation. Negative assessments are especially pronounced among supporters of the opposition LDP and those who support neither the LDP nor the ruling DPJ (71% and 77%, respectively). Meanwhile, DPJ backers are evenly split regarding the national government’s response: 47% approve and 47% disapprove. Beyond immediate recriminations, the crisis at the Fukushima Daiichi plant has raised questions about the long-term future of nuclear energy in Japan. The Japanese public is divided on the issue. Nearly half (46%) favor maintaining Japan’s reliance on nuclear power at its current levels, while 44% think the use of nuclear power should be reduced. Only 8% believe the country should increase its use of nuclear power. Support for reducing the use of nuclear energy is somewhat higher among those who are worried about radiation exposure (46%) than among those who are not worried about this possibility (40%). Consistent with their concerns about radiation exposure, women are considerably more in favor of reducing the use of nuclear power than are men (53% vs. 34%). Those with a university education are also more in favor of reducing Japan’s utilization of nuclear power (52%) than are those with up to a high school degree (40%).